Summary: Use the freely available Convert-WindowsImage.ps1 to extract multiple bootable VHD files for Hyper-V Server 2012 R2. Is there an easier way to create a VHD file that already has the operating system, rather than installing it and clicking Next…Next…Next? I’d like something that could spin up a simple machine like it was a template. Ideally this solution, as I was thinking to myself, could even potentially leverage Windows Powershell Desired State Configuration in the long term. More importantly, I wanted something that could be simple enough that a person with minimal knowledge of Windows PowerShell could easily use to spin up machines. I will make some important notes. Although this solution is targeted to use the free tools, it works equally well in the full versions of Windows Server 2012 R2 and Windows 8.1. It might work with Windows Server 2012, but I haven’t tested it yet. Theoretically, it should all work. So a few pieces came together. For software, I opted for the following free tools from Microsoft and the IT community. Free script written by a Microsoft partner, Pronichkin, to directly convert a WIM file to a bootable VHD. This is a great tool! I’m going to presume that you at least know how to setup Hyper-V. If you download the free version, you’ll need to run sconfig to configure the environment. It is a really nice easy-to-use VBScript script that does all the nasty work. You’ll also have to remember that it defaults to Cmd.exe, and you will have to launch Powershell.exe to execute all of your scripts. If you’re curious about trying to get a Hyper-V environment initially configured, here’s a series I wrote a while back on TechNet that will give you some tips: Hyper-V and the Windows PowerShell Cmdlets. So with the presumption you have a server running Hyper-V, our first task is to get all those goodies out of the WIM file. I want to avoid typing anything as much as possible. 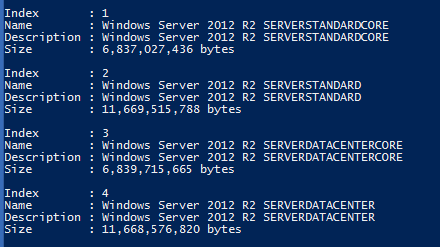 I would also like the VHD files that I create to reflect the version of the server. Within the latest Windows Server environments, there is a built-in cmdlet called Mount-DiskImage, which will allow us to mount either an ISO file or a VHD file directly from Windows PowerShell, and then access its contents. Now with the drive letter in a scriptable state, we need to get some information about the WIM file. We need to know how many images are in the WIM file and the descriptions for each image. We will leverage this information when launching the Convert-WindowsImage.ps1 file. Save this file into a folder. In this post, I am referencing C:\ISO, which is where I wrote this environment from. Make that location and save it there for ease-of-use. I called my CREATE-VMTemplate.PS1. Come back tomorrow when we go to the next step and make an easier way to configure the VHD before attaching it to a virtual machine.